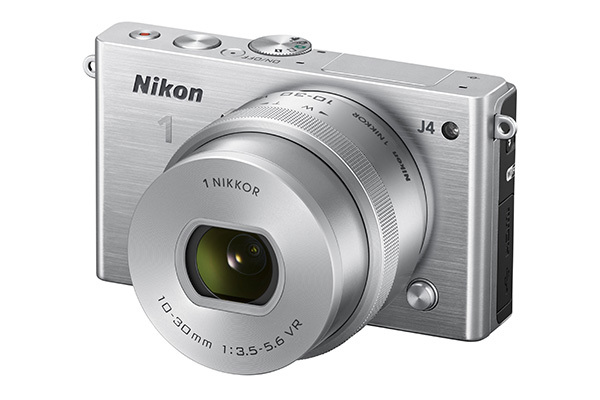 The Nikon 1 J4 is the latest compact system camera from Nikon, sitting in-between the entry-level S2 and enthusiast-level V3 in the range. The J4 has similar functionality to the AW1, Nikon’s waterproof CSC, and is designed to appeal to those looking for a compact, easy-to-use CSC with full creative control when they need it. At the heart of the camera is an 18.4MP CX sensor, which is the same size and resolution as the one found in the V3. This gives the J4 around 4MP of extra resolution than its predecessor. Unfortunately, the sensor is one of the smallest on any current CSC, giving it a significant disadvantage against other cameras in terms of dynamic range, low light performance and colour depth. It also means images have a larger depth-of-field (at the same composition and aperture), making blurry backgrounds harder to achieve. According to DxO Labs, the world’s leading sensor and lens tester, overall image quality is inferior to similarly priced CSCs such as the Sony NEX-5T, Olympus E-PM2 and Panasonic GM1. As well having the same CX-format sensor as the V3, the J4 shares the same brand new EXPEED 4A image processor, which is Nikon’s fastest current imaging engine. This helps make the camera very responsive, with a fast start-up time, short shooting lag, and smooth menu operation. It also enables an increased ISO range, a faster shooting speed and improved video performance. On the rear of the J4 is a 3in 1037k-dot TFT LCD, which is touch-sensitive for fingertip shooting, focusing and navigation. The screen is identical to that on the more advanced V3, though it doesn’t tilt out, so composing images from high or low angles is slightly more difficult. The screen is bright and has good contrast, though our review model did have a green cast. As with all ‘J’ models, this camera has no electronic viewfinder (EVF), and no hotshoe to connect one, so if this bothers you, the V3 may be a better option. The J4 has built-in Wi-Fi, allowing users to share images wirelessly, and it also facilitates remote control by smartphone or tablet. Simply download the free Nikon app, go through a short set-up process and many camera settings can be altered from several metres away. There is no NFC connectivity on this camera though, as Nikon is yet to adopt this technology for its CSCs or DSLRs. One of the most impressive features of this camera is the fast and accurate hybrid autofocus system, which uses 171 focus areas covering almost the entire frame, with 105 of them supporting phase-detect AF. When the camera is set to auto AF, it uses 41 focus areas. There’s also subject tracking for keeping moving subjects perfectly sharp as they move around the frame. Another of the J4’s most impressive features is its video functionality, shooting Full HD (1080p) movies at 60fps, and extreme slow-mo video up to 40x slower than real time, albeit in very low resolution and for 3-second bursts (lasting up to 2 minutes during playback). This slow-mo functionality is a lot of fun, and probably far more appealing to most users than 4K, which costs a lot more. The J4 has a built-in pop-up flash, though with a fairly modest guide number (flash power) of 5. Slow-sync, fill-in, rear curtain and red-eye flash modes are available for plenty of added control. The J4 uses microSD cards rather than the usual SD, and is available in black, white, silver and orange. The Nikon 1 J4 has an ISO range of 160-12,800, which is slightly wider than its predecessor, the J3. At lower ISO settings, as expected, digital noise is fairly minimal. However, by ISO 800, noise starts to become noticeable, especially in areas of plain colour, though images are still quite useable. By ISO 3200, noise is fairly severe, and starts to detract from the aesthetics of the image. This is unusual for a CSC, which can usually produce acceptable shots at this ISO. By ISO 6400, photos are borderline unuseable, and by 12,800 images have extremely severe colour noise and cannot be rescued even using noise reduction software. Overall noise performance is poor compared to similarly-priced models, so the J4 is not the best option for those who often shoot in low light. While the J4 does have some impressive internal features, the external handling is very basic, with no grip or rubberised coating for the fingers, and only a few, small external buttons. While there is a mode dial on the top-plate (MASP modes not included), there are no finger dials for changing settings, forcing users to rely on the small thumb dial on the back of the camera. This doubles up as a D-Pad that will bring up options for shooting mode, exposure compensation, flash settings and a Quick Menu. The fastest way to change the key settings of aperture, shutter speed and ISO is either through this menu or by controlling them via touchscreen. This is fine, though definitely less convenient than having a dedicated ISO button and a second dial. This makes the J4 well suited to those who will use the camera in auto mode most of the time and only occasionally need to go into manual or semi-manual settings. This is great for anyone stepping up from a basic compact who wants uncomplicated and intuitive settings, with more advanced controls tucked out of the way. The J4’s 10-30mm kit lens has a maximum aperture of f/3.5-5.6, and its 2.7x crop means an equivalent depth-of-field of f/9.5-15. The zoom mechanism is electronically powered for a smooth, low-resistance zoom ring and an electronic lens cap. However, any videographerswanting to do zoom pulls will be disappointed by the jerky zooming at slower speeds. The lens has a minimum focusing distance of 20cm, which is perfect for close-ups. The 10-30mm’s lens quality is fairly good, displaying relatively minimal chromatic aberration and sharp corners at wider focal lengths. However, zoomed into 30mm there is some corner softness at wider apertures. Severe distortion affects the whole zoom range. The 10-30mm has Vibration Reduction (VR) built-in to limit camera shake in low light. Nikon has 13 lenses in its CSC range, though a mount adapter (£229) allows most of Nikon’s DSLR lenses to be attached, so total availability is 90 lenses. The J4 comes body-only for £429 or in a kit with a 10-30mm PD-ZOOM lens for £500. The camera is a decent mid-range CSC with a touchscreen, hybrid focusing, impressive video functionality and a shooting speed far faster than any other CSC in its class, making the J4 perfectly suited to sports and wildlife photography. Unfortunately, the camera’s CX-format sensor is one of the smallest on the market, so dynamic range and low light performance are fairly poor compared with other similarly-priced cameras. The camera lacks the flip-out screen, hotshoe, handgrip and multiple control dials of the more advanced V3, accounting for it being around £300 cheaper, though most of the main features (sensor, processor) are identical. There are cameras with better image quality for the money, though if you’re looking for a mid-range CSC for capturing fast-action subjects, the J4 has some unbeatable features.